"I adore Bavarian cuisine! And since there's no good German food here (while I lived in San Francisco, my husband and I ate at wonderful German/Hungarian restaurants there), I have to make my own...This recipe is crazy simple." Place bacon in a large oven-safe or cast-iron skillet and cook over medium-high heat, turning occasionally, until evenly browned, about 10 minutes. Drain the bacon slices on paper towels. When cool, crumble bacon; leave bacon drippings in the skillet. Whisk flour, kosher salt, and smoked paprika together in a bowl. Coat chicken thighs in the seasoned flour and brown on both sides in the hot bacon fat over medium heat, about 5 minutes per side; transfer chicken to a plate. Drain bacon grease except for 1 tablespoon; cook and stir onion and apple until onion is translucent and apple is softened, about 5 minutes. Stir red cabbage and bacon into onion-apple mixture, sprinkle with a pinch of kosher salt, and cook, stirring often, until cabbage is softened, 5 to 8 minutes. Pour red wine vinegar and red wine into skillet. Stir in brown sugar and cinnamon and bring cabbage mixture to a boil; cook until sauce is reduced by half, stirring often, about 10 minutes. 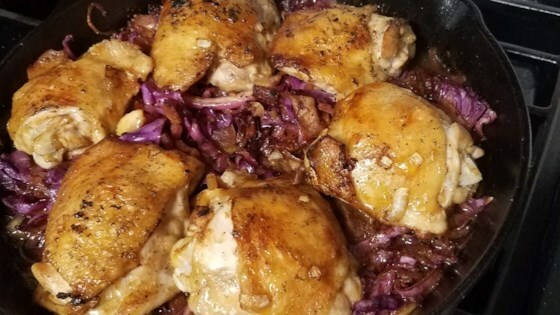 Arrange chicken thighs on top of cabbage in the skillet. Bake in the preheated oven until cabbage is tender and chicken is cooked through, about 40 minutes. An instant-read meat thermometer inserted into the thickest part of a thigh should read at least 160 degrees F (70 degrees C). I would definitely make this again! I would not bread the chicken next time though. I would just season and cook as directed. Thighs have enough flavor without the breading. I was a bit skeptical but I really enjoyed this recipe. It was a tiny bit on the sweet side so I might reduce the brown sugar in the future but it was fine as is and I would make it again.